The Market Hall dates back to 1846 and the recently refurbished Fish Market is one of the best in the country. 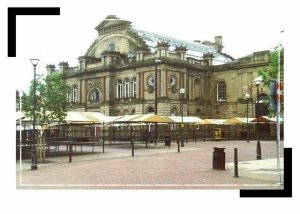 The area is dominated by the magnificent Victorian Corn Exchange, which was badly damaged by fire in 1994 and has undergone extensive restoration before it was reopened to the public. There is a wealth of pubs and inns around the Market Place to refresh weary bargain-hunters and over 650 stalls in the covered and open-air markets. Doncaster market is situated within the town centre to the east. E-Mail doncaster.markets@doncaster.gov.uk Service Contact Markets and Events Management, 38-40 HighStreet, Doncaster, DN1 1QZ. Linda Lancaster from Newtownards Northern Ireland: I was taken to Donny market as a small child by relatives who lived in Goldthorpe - then lived outside Donny. Twice! From 1988 to 1989 and 1994 to 1995. There are still stalls there that I remember as a child. I have such lovely memories of the market and every Tuesday I wish I was there!!!! Peter Emson from Cheadle: We enjoyed our visit to Doncaster especially the fish market and shopping centre. Will hopefully vist again soon. Di Pickersgill from New Zealand: I lived in Doncaster most of my life and still visit family in Scawthorpe, its a great place to shop and I always look forward to getting my bargain, I just love Rothwells fish and chip shop and I miss mushy peas. Lesley Jacques from Cornwall: i would just to say well done to every one who work on Doncaster Market. As i know as i did work on Doncater market it has its ups and down but the market is looking really good! The market cafe is in it 3rd year and thing are doing really well (thats were i worked about a 2 years ago then R Topping and son) I LOVE DONCATER MARKET!!! jennifer dunn from canada: I lived in Doncaster in 1972/73 and well remember how much I enjoyed shopping in the market. I had come to Donnie from Ireland and found everyday items much cheaper than in Dublin. I used to enjoy going into the market from Balby where we lived and coming home laden with goodies. Tony Tinto from Canada: Married a girl from doncaster england, visited doncaster market many times loved the friendly atmosphere,and the yelling vendors will be back soon to taste the lovely fish and chips from rothwells. Lesley Lewis from Dorset: i love doncaster market evey one is so nice. i got some meat from R Toppings and son and the meat was really nice and very one was really nice. The cod bites and chip from quayside must be the best in England!!! Linda Jenkins from Donny Lass in Australia: When I come home to see my family, the first place I head for is the fish market. Everyday I buy small plates of cockles and whelks!! Fabulous place, love it to death!!! Rosemary Hay from Auckland, New Zealand: Visited the market in 1999 with my Yorkshire Aunt & Uncle. Loved the fish market as well as all the bargains. Coming back next year - it will be a highlight of our UK trip! BUT MY FAVORITE STALL IS BETTYS BEAUTY BUYS. THE STAFF ARE ALWAYS SO KIND. adam beevers from gilberdyke: The fish are of outstanding quality and the handbags are great for hiding in. Want to know when your comment on Doncaster Market has been approved? We won't use it for any other purpose. If you don't wish to receive any email, please leave it blank.